Home remedies for swimmer’s ear: Swimmer’s ear is an infection that occurs in the outer ear canal, precisely in the tube that connects the opening of the ear to the eardrum, or more specifically, the otitis externa. This is something that all of us have gone through at some point or the other wherein water is left behind in the ear canal post a session of swimming or showering. 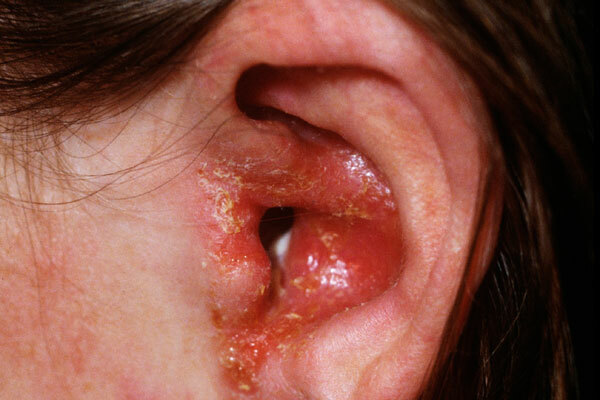 From this, a breeding ground for bacteria is born, causing an ear infection. In some cases, however, it can also be caused by a fungus or virus, although rare. Aggressive cleaning of the ear canal and excessive use of headphones or a hearing aid could also be the reason for an infection. The infection in itself is not contagious, but could lead to serious issues if not treated in timely manner. Drainage of a clear, odorless fluid in small quantities. Itching in the ear canal. Mild discomfort in front of the ear. Fortunately, there are some home remedies for swimmer’s ear that can be used to seek immediate relief. Hydrogen peroxide is said to be one of the most effective home remedies for swimmer’s ear as it behaves as a natural antibacterial agent, drying out the fluid in the ear and eliminating infection, if any. Procure 3% hydrogen peroxide from the market. Lay down and with the help of a dropper, put 2 or 3 drops of it into the affected ear. Remain in this position for a couple of minutes. Tilt your head to enable the fluid to drain out of your ear. Repeat this remedy a few times a day. White vinegar is can also be used to get rid of swimmer’s ear as it is slightly acidic in nature, thereby helps in fighting off the infection. It also cleanses the ear, removing traces of the bacteria. Lie on your side with the infected ear facing upwards. With the help of a dropper, put two or three of these drops into your ear. Wait for up to five minutes. Soon after, tilt your head in order to allow the solution to drain out of your ear. Repeat this process twice or thrice every day. For pus or fluid discharge from the infected ear, opt for a warm compress. This promotes the flow of the fluid, easing the pain in return. It also gives your ear a soothing sensation. Soak a washcloth in warm water, wringing off the excess water. Tilt your head so as to drain the liquid. Take a break for about ten minutes and repeat this process as and when required. Place a heating pad wrapped in a towel on your bed. Lie down and put the infected ear on this heating pad for a few minutes. Repeat this process a few times. Garlic deserves a special mention in our list of home remedies for swimmer’s ear as it fends off almost any type of infection, including ear’s with its antimicrobial and pain relieving properties. It also kills the bacteria responsible for the infection and reduces pain. Crush a few cloves of garlic and add them to two tablespoons of olive oil. Heat this oil until the garlic turns brown. Strain this and allow the oil to cool down. Put two or four drops of this oil into the infected ear. Repeat this process once or twice every day. You could also consume two or three raw garlic cloves every day in order to speed up the healing process. Caution: If a fluid is draining out of your ear, it is best you steer clear of garlic oil. Onion juice is another home treatment for swimmer’s ear. This is mainly attributed to its ability to act as an effective disinfectant, providing relief from pain within a short period of time. Extract the juice of a small onion. Put two or three drops of this warm juice into the infected ear. Wait for about five minutes and then tilt your head so as to drain out the fluid. Repeat this process twice or thrice a day. It may sound strange, but basil is antibiotic in nature and it helps to fight the infection providing relief from the pain. It is also loaded with anti-inflammatory properties, and benefits the immune system when consumed on a regular basis. Lie down and with the help of a dropper put 2 or 3 drops into the infected ear. Related: How to get rid of ear wax with home remedies? Keep your ears dry. This means that it is important to keep away from swimming and other underwater sports until you get rid of the infection completely. Keep away from earplugs, hearing aids or headphones during treatment. Do not place foreign objects, such as cotton swabs, paper clips or hairpins, in your ear to dig out the earwax. Be careful not to get hair sprays or hair dyes into your ear, as the chemicals present in them can irritate your ears. If it isn’t possible to avoid swimming, consider wearing earplugs and make sure to dry your ears with a towel or a hair dryer on a low setting after a swimming session. If water has entered your ear, turn your head from side to side so as to drain out the water. We hope these home remedies for swimmer’s ear came in handy for you. If the condition does not get better within four days, a visit to your local doctor mandates.